That young girl was my daughter. 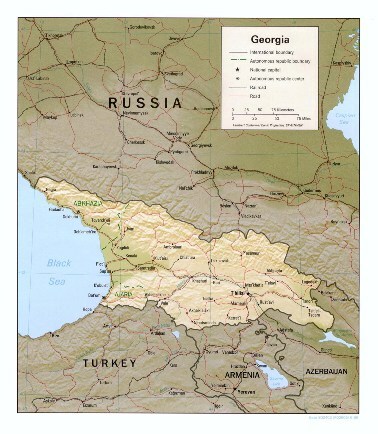 She confused the country of Georgia with our own state of Georgia after hearing the report of the unrest overseas. She did not know that there was a sovereign nation that bears the same name as the state we live in here in the USA. Yes, the report on TV was accurate, but her interpretation of the facts and conculsions based upon her limited knowledge were false. So my wife took time to ease her fears and correct her misunderstanding. Oh, if all misinterpretations and false conclusions could be corrected as easily as in this example, yet we are not so fortunate. Rumors and false conclusions based upon reported facts are ever present with us in all walks of life. Several years ago it was reported in Chattanooga that Barry Gilreath and his band would be performing at a local nightclub. You can imagine the attention this drew as members of the church learned of this report. Had Barry Gilreath given up preaching and taken up the nightlife at the local clubs? Imagine how embarrassed some were when they learned that the Bary Gilreath who was performing at a nightclub was not the same Barry Gilreath they knew. They had the same name, but they were not the same person. Some didn’t stop to think that the nightclub performer might just be a different Barry Gilreath. Such is the basis for the rumor mills. Now back to the example of my daughter and her assumptions concerning the fate of Georgia. What if my wife and older son had not been present to correct her misunderstanding regarding the invasion? What might have happened after she heard the dreary report? Perhaps she would have picked up her cell phone and bagun texting her friends. This is the way many young people communicate today – they text one another. If she had begun contacting others with this information, do you not think that there would have been other naive young people who might have received the report and passed it on to others? We might laugh a bit at the folly of a young child who hears a report about the Russians bombing Georgia, and assumes there are invaders flying overhead targeting their home. Nevertheless, does this not illustrate through the world of a child a more serious problem that often plagues those who are adults? Are grownup rumors not started in a similar fashion? So often these facts have no significance yet through the passing of the information through the filters of interpretation, they can grow to represent something very devilish. How many rumors have begun as a bean in size and through the assumptions and interpretations of others of the so-called facts, the bean grows into a beanstalk? Have you ever been guilty of planting a bean only to see it grow to a great height? it happens all too often. All of us are susceptible to these types of failings. I am certainly including myself since preachers can sometimes be the worst about assuming things and passing information off as legitimate when such is only a product of the rumor mill. Sometime ago an email was circulated among preachers regarding the health of another Gospel preacher. The email indicated that the man under consideration had a reoccurrence of prostate cancer and that he was undergoing radiation treatment. This was passed from preacher to preacher via the internet. Incredibly, when the man who supposedly had prostate cancer learned of the rumor, he was amazed since he said that he didn’t evne have a prostate. It had been removed some time ago. So much for factual reporting and accurate sources. I can also remember when a bulletin came out that announced the death of brother Garland Elkins. When I read the bulletin I was quite surprised by this announcement. I had worked with brother Elkins for a period of time in the 90’s and was shocked to learn of his demise. However, you can imagine that I wasn’t as shocked as Garland Elkins himself when he learned of the report. He was just as much alive as I am today. Though not everyone’s intention is to do harm in passing information along, we need to learn the importance of going to the source to help insure that misinformation or false interpretations of facts are not spread as truth. The Apostle Paul warned of some who go house to house and are tattlers and busybodies who speak things they ought not (1 Timothy 5:13). What some brethren did by foot in the first century, others do by internet in the 21st century. Regardless of the day and time, the sin is yet the same. We need to put the rumor mills out of business and the best way to do that is not to buy their product. Rumor mills exist because rumors are in demand. People in general want ot know of the salacious details and supposed reports. The recently reported affair of former Senator John Edwards is on the front page of the tabloids because juicy details and rumors sell product. Sadly, though, sometimes, Christians are not different in their tastes than those in the world. If you as a Christian want to put the tattlers, busybodies, and rumor mongers out of business, refuse to give them the time of day. So the next time you hear someone say, “Did you hear about so and so…?”, take time to remember the story of the little girl who heard a legitimate report about the Russians bombing Georgia. She heard correctly, but she assumed incorrectly.